Sorry, but no official profile of Star Axe has been added yet. A hand tool with one side of its head forged and sharpened to a cutting edge, used for felling trees, splitting timber, etc. 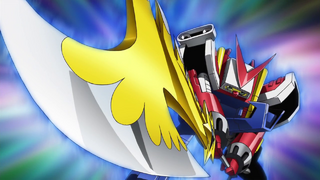 Anime/Manga Digimon Xros Wars: "Island Zone, Upheaval"
↑ Digimon Xros Wars: "Island Zone, Upheaval"
This page was last modified on 12 October 2018, at 19:13.